Today’s earthquake, which caused minor injuries, struck around 2:29 p.m. local time about 6 miles north of the city of Pohang. Old buildings collapsed and concrete roads cracked open. Some residents in Seoul even detected the vibration several hundred miles away. 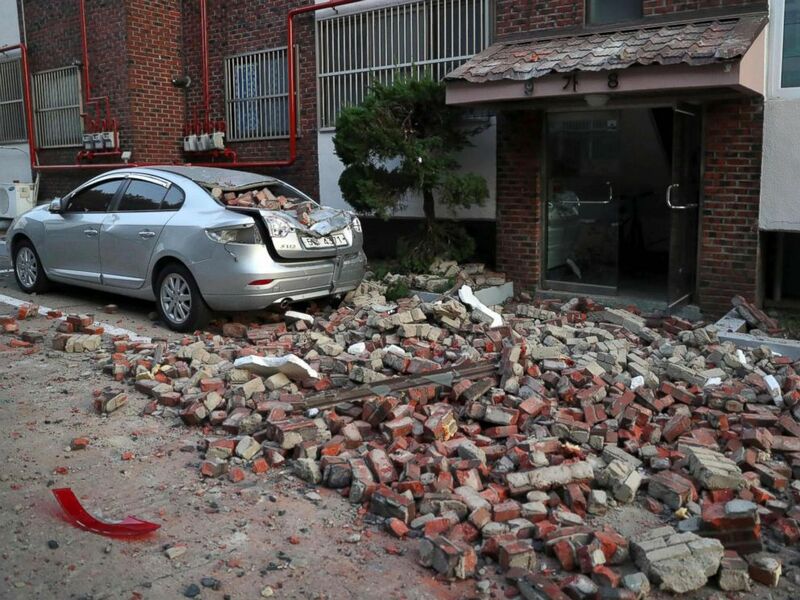 A car damaged by falling bricks after a 5.4-magnitude earthquake is seen in the southeastern port city of Pohang, Nov. 15, 2017. 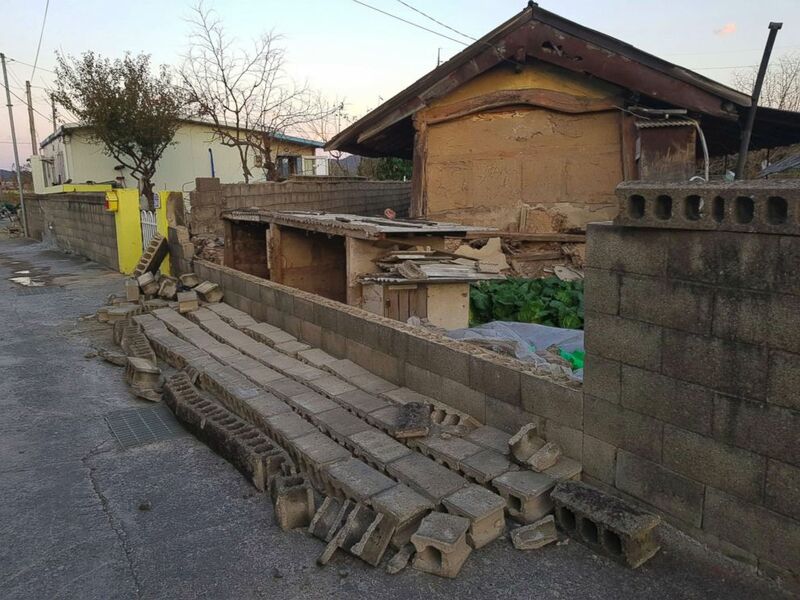 Damage to the wall of a house is seen after a 5.4-magnitude earthquake in the southeastern port city of Pohang, Nov. 15, 2017. There have been 18 aftershocks, officials said, ranging in magnitude from 2.2 to 5.4 as residents tweeted in real-time on the damages. At Handong Global University, an outer wall of a school building collapsed. Books fell from shelves and furniture trembled, as seen through videos from social network services. Fifty people suffered minor injuries, according to the National Fire Agency, but the number is expected to rise. The epicenter of the quake was about 5 miles underground, according to South Korea’s Meteorological Administration. The more shallow the epicenter, the bigger the shock above ground. “The earthquake is the second-strongest natural earthquake to take place in the Korean peninsula since last year’s quake in Gyeongju,” the meteorological administration said. 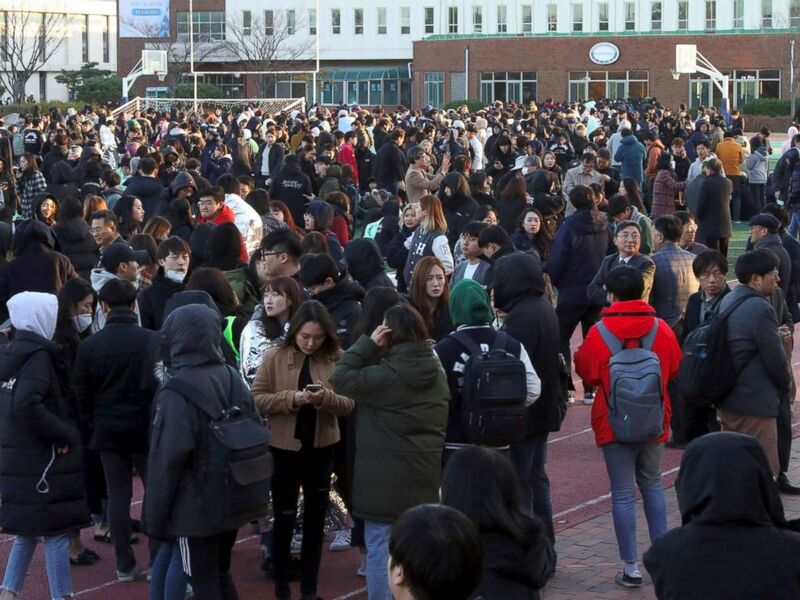 University students stand in an open space to take shelter after a 5.4-magnitude earthquake in the southeastern port city of Pohang, Nov. 15, 2017. Last year’s earthquake had a magnitude of 5.8, damaging many cultural sites and buildings. A total of 139 quakes of magnitude-2 and above have been detected this year alone, which is more than twice the historical average. South Korea had been known to have little seismic activity compared to neighboring Japan. Meanwhile, no leakage or breakdowns were detected at the six nuclear reactors in Gyeongju, according to Korea Hydro & Nuclear Power. But because of the possibility of more quakes, the annual college entrance exam scheduled for Thursday has been postponed for safety concerns until next week. It is the first time the entrance exam has been delayed for any reason in its 24-year existence.